Update of February 2, 2016: I've heard from a Clark descendant who tells me that this farm, located on Old Colony Road, at the foot of Mt. Wachusett, is protected as a historic place. 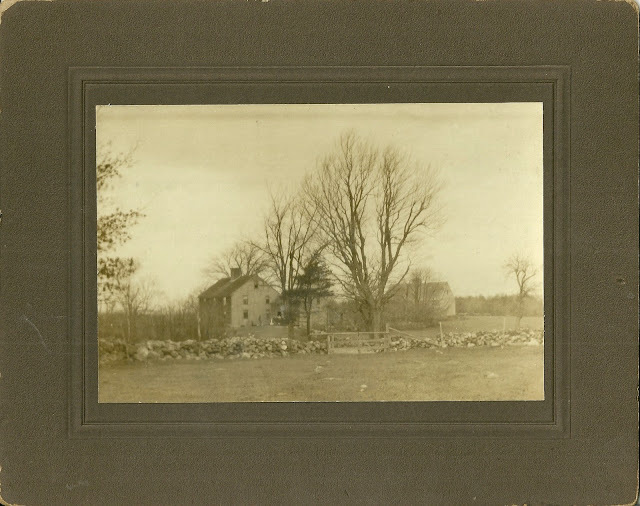 Amazingly, I have found another photograph of a house I discussed back on October 12, 2010, the farmhouse of L. E. Clark of Princeton, Massachusetts. Here is the link to that earlier post: Old Photograph of the L. E. Clark House, Princeton, Massachusetts. That photograph was a closeup of the house and ell. This photograph, taken from a field or pasture, shows the house, a wonderful stone fence and outbuildings of what must have been, and hopefully still is, a very picturesque New England farm. 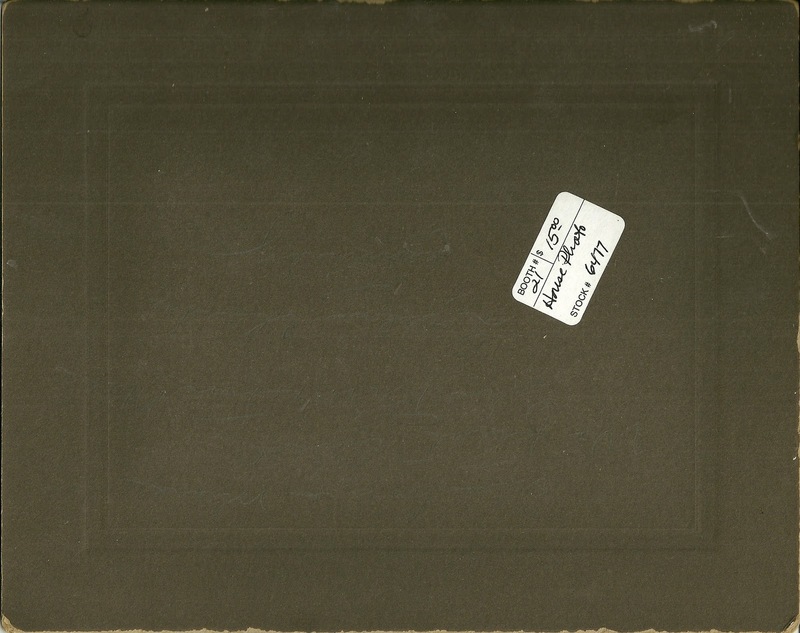 The identification on the reverse is written in pencil against a gray background so you may not be able to decipher it from this scan. It reads: Old house where we first lived in Princeton, Massachusetts. Leslie Clark & Family. I'm not sure what is meant by the last part -whether the ID was written by a member of the Leslie Clark family or by a later occupant family. Researching online, I found a Leslie Everett Clark living in Princeton, Massachusetts in the Censuses of 1910 through 1930. Leslie Everett Clark was born about 1868 in Massachusetts, the son of Everett Osborn Clark and his wife Mary (Osborn) Clark. Leslie's paternal grandparents were Isaac and Almira (Osborn) Clark. I haven't yet determined the parents of Leslie's mother Mary (Osborn) Clark. Leslie Everett Clark married Mary Ada Pendleton, who was born about 1866 in Meddybemps, Maine, the daughter of Andrew and May (Pierce) Pendleton. The family had moved to Wayland, Massachusetts by the 1880 Census. Mary Ada Pendleton's paternal grandparents were Andrew and, possibly, Mary (?) Pendleton. I don't yet have information on the parents of May (Pierce) Pendleton, who was born in New Brunswick, Canada or Maine. Leslie and Ada had a son, George Everett Clark, born in 1893 and several others in the following years. Leslie Everett Clark, according to a reference online, died in 1936. There's a Pendleton's Island in Passamaquoddy Bay near St. Andrews, New Brunswick, settled back in the 18th century by the Pendleton brothers, Gideon, Stephen and Thomas Pendleton. It's now a protected area, given by the Nature Conservancy of Canada to Canadians as a birthday gift on Canada Day 2003. Hi, The house originally belonged to Everett O clark and Maria Osborn of Petersboro New Hampshire. I grew up with photos of that house. My Grandmothers, Grandfather (Franklin) was Everetts Brother. We were in correspondence throughout my lifetime and remember the names fondly.